GeForce 8600 GT: What Do You Guys Think? | OhGizmo! Back at my place now. Had a massive hard drive failure on the desktop the other day. Perfect excuse to order a new barebones kit, right? Sure, the rest is probably fine… but what fun is being sensible? 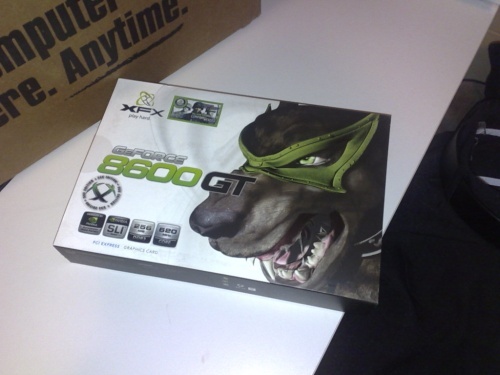 So, stuff came in the mail today, and here’s the video card: XFX GeForce 8600 GT. I know it’s not the newest, or the best. Just was wondering if any of you guys are using this, and if you have any comments about your personal experience with it. FWIW, this is the card I’ll be buying when I rebuild (fairly soon). I’m not major gamer, but it seems like it would do for newer FPS’s at moderate resolution. It’s far from the best..with monsters like the HD 3870 X2.. But it’s a great card for it’s low price, even if you won’t be running Crysis any time soon. I recognize that box. That’s the card that my nephew asked for for Christmas and which I supplied. He did his research and said that it was the best card around for the money…in the neighborhood of a hundred bucks. The user ratings on Newegg are very high and he’s happy with it. Sure, feel free to email me if you need any help, I think I went through almost every problem that was possible when building my rig. Hah, anything you guys have is way better than mine. I think I’m going to go out and buy a new one just to make my ego happy :P.
Shouldn’t you asked that before you bought it? @Alan. Sure, I could have asked that. I could have done some research, and bought a top notch rig with all the best parts. But this was a $400 barebones kit from TigerDirect, and that seemed like a good price. So I bought it, and now I’m just trying to have a little conversation with my readers about the stuff I bought. @david Well i’m a very impulsive buyer to (hurray for adhd) so i wasnt judging you (or you’re great site) just thought to point out that… well.. you know. Don’t bother with SLI. sell this one and get a 8800GT. Much, much better. That is technically right, but since he already has a 8600 getting another isn’t really that much worse than one 8800. Especially not after he’s overclocked/tuned it with the bundled software. Getting two 8600GTs in SLI won’t be nearly as good as a single 8800GT…especially if it’s a 512mb one. I have that exact card… in fact I still have the box for it 🙂 I like it… not using it for much gaming. Mainly a new Vista Box and it gives a Windows Experience rating (on the card) of 5.5… not bad for the price!